Fast fashion companies harm not only the environment, but consumers' wallets. With Black Friday approaching, many SCHS students will be lining up at clothing stores to get the best deals, especially from fast fashion companies. Inexpensive, accessible and trendy, these brands will have some of the lowest prices for Black Friday, becoming more of a target for young, fashion-conscious shoppers. While the prices are good, the costs for fast fashion companies are high. Fast fashion describes companies that are constantly producing trendy clothing inspired by the latest runway styles. What used to be seasonally-released collections are now coming out weekly. These companies produce a large quantity of a certain piece, and when it sells out, they remove it from stores and deliver something extremely similar, claiming that it is the “newest trend.” According to an article by Pasty Perry from Independent.co.uk., in order to sell more, brands need to tempt their customers with constant newness and make them think their current clothing is no longer trendy. This marketing and money-making technique impact not only consumers but also the environment. Consumers begin this cycle of constantly buying clothing, throwing it out and then buying the “newest” and “trendiest” pieces. Habits like this are encouraged by fast fashion companies. Although some people donate the old clothing, much of it ends up in landfills and synthetic materials can take over hundreds of years to decompose. Fast fashion companies are a major culprit of plastic pollution. Inexpensive clothing is made with cheap materials that are harmful to the environment. These include polyester, acrylic and nylon. Synthetic fibers are man-made to emulate expensive natural fibers. However, these fibers break down in the wash and are released, adding to the extensive amounts of plastics already in the ocean. Products sold by fast fashion companies are created in sweatshops. These are factories underpay workers and do not meet workplace safety laws. Some make as little as $4 an hour, working up to 11 hours a day, all in unsafe and unhealthy conditions. According to the Department of Labor, 11,000 sweatshops in the United States broke laws regarding overtime and minimum wage, and 16,000 violated health and safety standards. Putting an end to fast fashion does not mean people have to stop buying clothes altogether. One solution is to start buying ethical clothing. There are many aspects that make a brand ethical, but in general, it means that the brand follows laws about working conditions, wage and sustainable production. Purchasing from ethical companies means supporting eco-friendly brands that address problems the current fashion industry hasn’t, helping the lives of people and the environment. 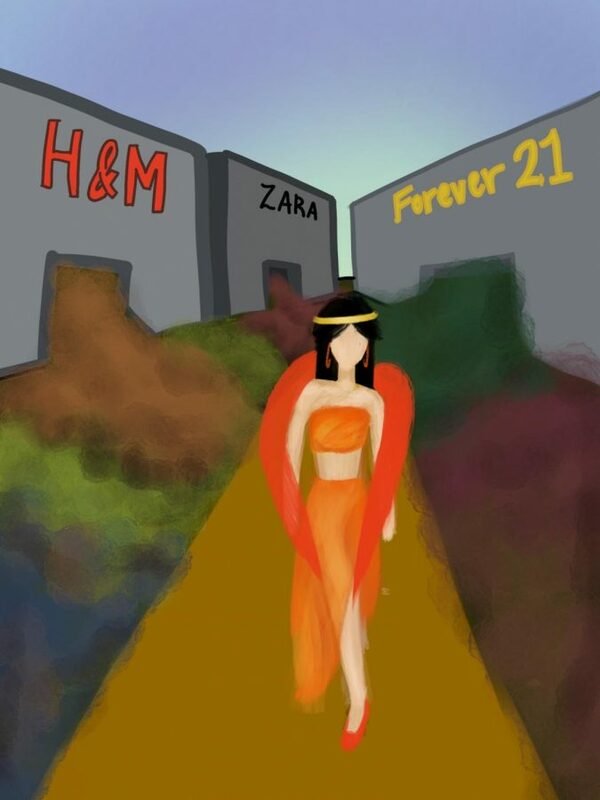 Fast fashion companies like Forever 21, Zara and H&M are growing in popularity. However, their manufacturing and marketing methods are causing harm not only to people but also the environment.